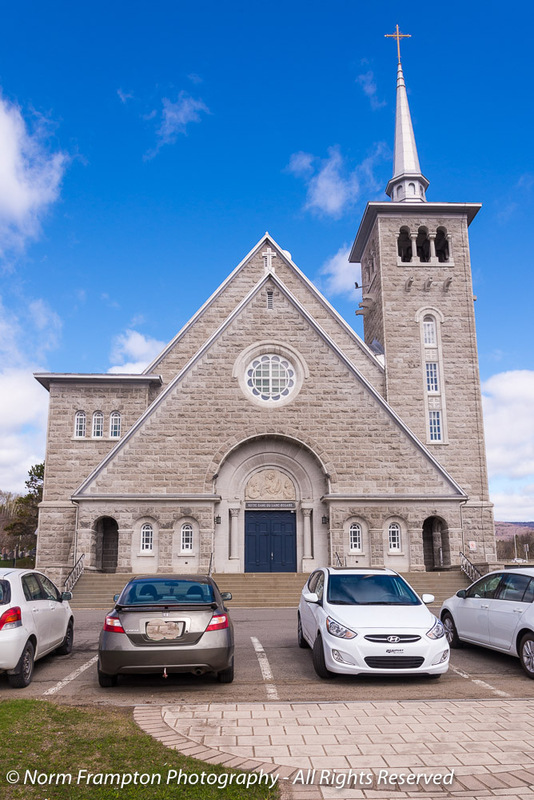 Last spring when I was exploring in the town of Beaupré east of Québec City, I drove past a rather plain nondescript church. Simple modern lines, newish looking stone facade. It was okay to look at but my first impression was decidedly m’eh. I reached a roundabout a short way down the road and something was telling me to circle back and take another look. As I tried to figure out what was suddenly drawing me in for a second peek, it became obvious to this door lover: the dark blue colour of these doors on l’Eglise Notre-Dame-Du-Saint-Rosaire was highly unusual for a church in these parts. 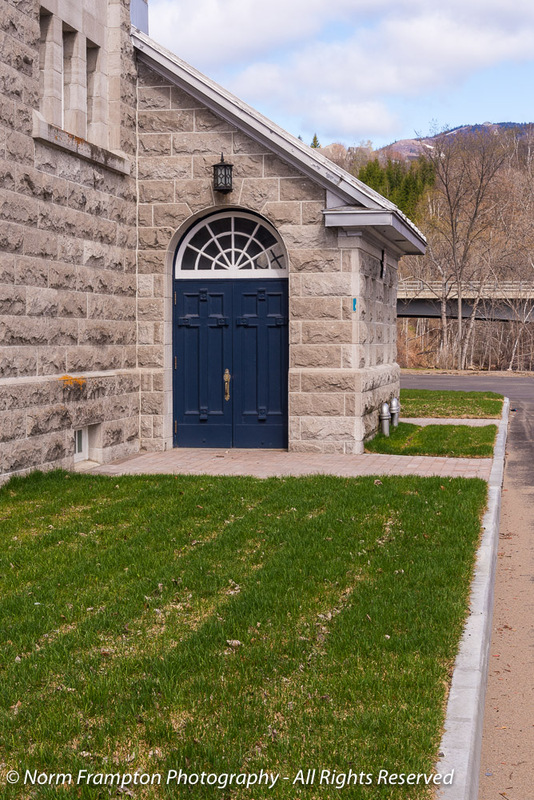 I mean as far as I can tell, blue doors of any shade are highly unusual on a church, period. The only other time I remember seeing it was on a church closer to home that I blogged about here in Mascouche. And I’ll be darned if that one didn’t have the same name. 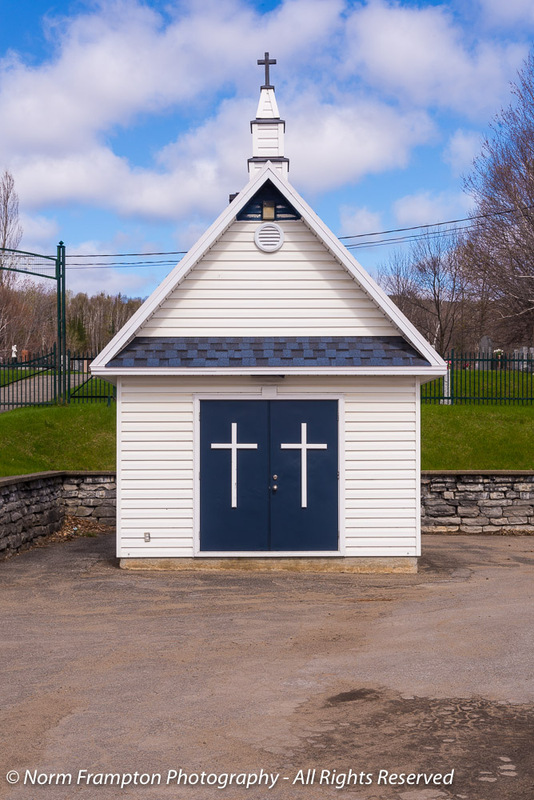 So now I’m down a rabbit hole trying to find out if two churches of the same name both having blue doors is just a co-inkydink or if there’s a connection between Our Lady of the Rosary and the colour blue. If anyone else has some insight on this please let me know. In the meantime, isn’t this last one adorable? I’m still unimpressed with the link-up tools I’ve been testing so once again this week you can share the link to your own Thursday Doors posts in the comments below. Want to join in on the fun and share your own Thursday Doors post with other door lovers? Then please add the link to your Thursday Doors post in the comments section below. 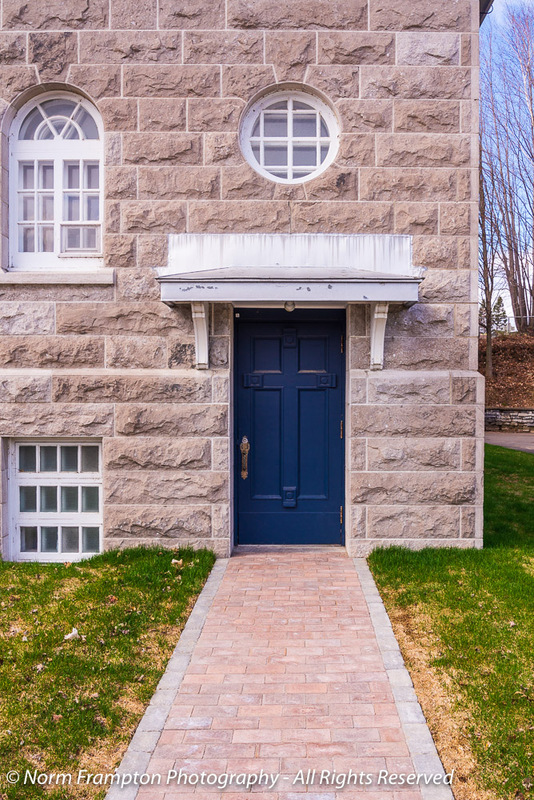 Gallery | This entry was posted in Photo Challenges, Photography, Thursday Doors and tagged Beaupré, blue doors, Canada, Church, Doors, Quebec City, Thursday Doors. Bookmark the permalink. The doors are beautiful. I have no insight as to why they might all be that dark blue, but it suits the light stone of the church very well. And it looks also looks nice on the white little outbuilding (I like how they went for blue shingles on that as well). It really is a stunning church. The stonework, ooh. I wonder about the doors. That last shot is so good. So simple and sweet — so many artful details. I can see how this drew you in to going back. I find it interesting that all the doors are blue. I don’t think I ever noticed that before on a church..Not the blue I mean, but all the doors being the same color. An interesting find. You’re right. Many churches don’t go for a totally uniform look for their doors. nice blue doors. Yeah it is unique. It wasn’t until I got to the 3rd photo that I realized the 4 panels on the doors produced a striking cross in the middle. Great catch, Norm. I’m here by way of jazzytower, whose doors I’ve been admiring for years–I love doors, have 4 or 5 jigsaw puzzles of doors which I really enjoy doing repeatedly. Now, my question is–are we invited to share pics of doors we find anywhere–or only ones we’ve personally photographed? I’m not a photographer. 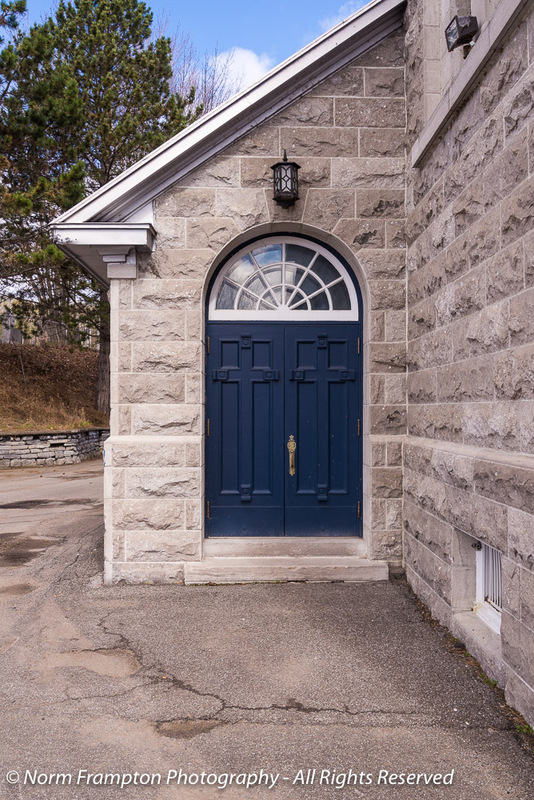 Anyway, I enjoyed discovering your blog and looking at this post’s photos–the church doors always appeal to me…and it hadn’t occurred to me that blue is an uncommon color for them. There are plenty of red ones, symbolic of course. Have a great day. Hi, Janet–thanks for clarifying. I was mostly just curious 🙂 Have a great weekend. We generally don’t encourage using someone else’s copyrighted material so as a rule of thumb we do expect the photos to be original, taken by yourself or someone you know who has giving you permission to use their photo. They don’t have to be top quality perfect shots though. In fact most of our contributors are not experienced photographers with fancy equipment, and that’s just fine..
Love the blue doors. Gives a little personality to something that looks like a million others. And I didn’t like the new link up thingy either. Why do they keep changing things that WORK? I pinged. Hoped it shows up in your comments to approve. Ping! Ping! Ping! Exactly Tara. It makes a nice change from plain wooden doors. BTW I put your link in your comment, because I usually circle back and delete the pingback as both a double-check to make sure I didn’t miss anyone and to keep the comments clean. Glad you went back for a closer look. Second takes are sometimes worth it. I’m glad I went back too. I don;t always do that though so maybe that’s the lesson to learn from this. I love the blue doors. They seem more welcoming than plain wood ones would have been. I’m loving the blue theme going on. Thankyou for sharing them. Thanks. Yes I thought the little outbuilding was the best; it’s so cute. I like the deep blue, but it is unusual to see on a church. Matches nice with the stone and your photos did this Church well. I love it that you drove back to take a second look. I think this is what separates the curious from the rest. I often return to places I have glimpsed while passing by to check them out properly. Lovely blue. It is never clear where a beautiful door will waylay you. Very nice finds. Forgot my link when I commented earlier! Loving these blue doors, on a rather blue and rainy E’ville day. Love the blue, especially the single door with the brick path leading to it, welcoming. Yes I think it has to do with blue being the colour of Mary. Thanks Jean. I found similar info from a number of places. I guess that is the most logical explanation for the choice of color. I have a couple of doors from the neighborhood of the Frank Lloyd Wright home and studio in Oak Park, Illinois. FLW might not have designed them, but I think they’re quite something anyway. Thanks Marian. The overwhelming consensus here is that blue is associated with The Virgin Mary so I think that’s the most likely reason for the color choice. It is certainly a very rich, majestic colour. That colour is sometimes referred to as royal blue, perhaps that has something to do with it. You had me intrigued so I did some googling (as one does) and found this article. Thanks Jackie. Interesting article. I had no idea that blue was considered the “color of an empress” but from that point of reference maybe the choice of color for the doors make sense. This church is beautiful, Norm. I would expect the dark color to hide some of the details, but the doors are sharp and I can see the very clean lines. I love the way the doors work with the stone and the simple fixtures. The contrasting white crosses are very sharp indeed. The Virgin Mary is often featured in blue. 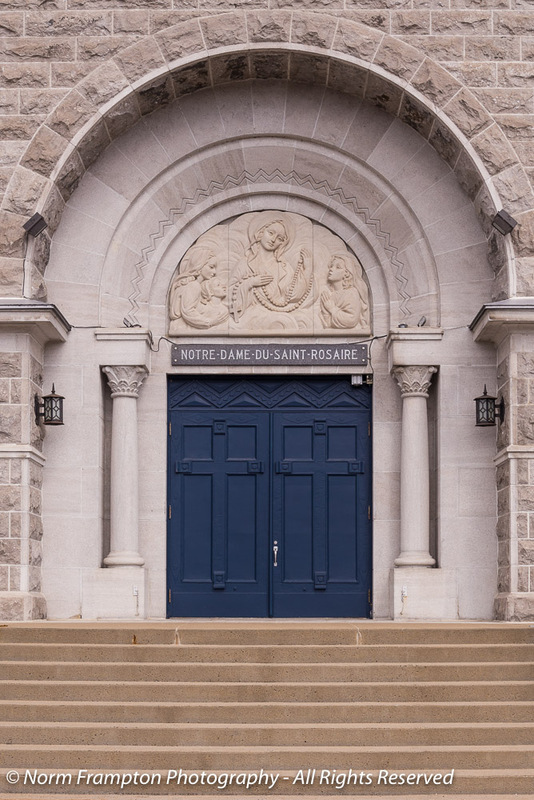 The Pantone color, Marian Blue is similar in tone, but much lighter than these doors, but if you search for Marian Blue images you will see this color (I hope that link works). Thanks Dan. Several others have also mentioned that The Virgin Mary is associated with blue so it most likely has something to do with the color choice.